Heat oven to 375°F. Grease bottom and sides of 8-inch square pan with shortening. No matter the name—crisp, crumble, or cobbler—any baked dessert filled with fresh fruit is defined by the topping. A crisp and crumble are close cousins, with their toppings of buttered flour or oats and sugar. A crisp is all about the oats that become browned and a little crunchy when baked. Many sweet crumbly or streusel toppings include chopped nuts; walnut, pecans, or macadamia nuts are good choices and will toast during baking. Choose crisp and tartly-sweet apples—Empire, Granny Smith, Honey Crisp, Braeburn, Cortland—they hold their shape and aren’t too juicy. Or sub in fresh blueberries or a combo of sweet pears and tart cranberries. Dark brown sugar bumps up the caramel-like taste surrounding the fruit, but you could substitute other types of sweeteners. Play with turbinado sugar or maple sugar. Get creative by adding other dried spices, candied ginger, or chewy dried fruits to add more layers of flavor and texture. Apple crisp is the carefree, easy-breezy cousin of apple pie. There’s no dough to chill or roll out, but the end result is just the same—a warm and fruity fall dessert that puts a smile on everyone’s face. The sweet-and-crunchy apple crisp topping makes it one of the most popular desserts ever, especially when apples are in season. Look for locally or regionally grown apples for your crisp, and seek out varieties of firm, tart apples that hold their shape when baked. Some perennial crisp maker’s favorites include Braeburn, Bramley, Gala, Cortland, Empire, Granny Smith, McIntosh and Northern Spy. Try an apple crisp recipe for a potluck or weeknight dinner, and you’ll be thrilled not only by how easy it is to make, but by how many compliments you receive. 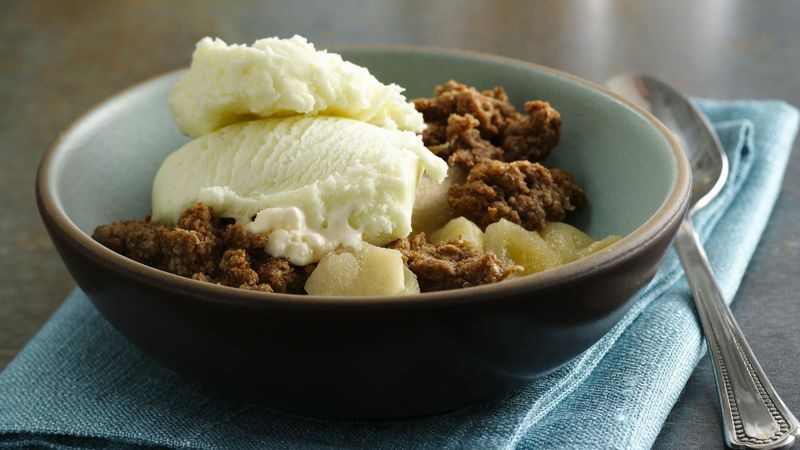 And don’t forgot the ice cream—it’s the serving suggestion that elevates any apple crisp from good to great. Once you’ve made this apple crisp recipe, you might be interested in trying even more of Betty’s best crisps and cobblers.